Brief Description: This book provides a guide to some of the many commercial fishes of the Eritrean Red Sea and the marine environment they inhabit. This guide is designed as a working tool for fisheries workers, investors and a general reader who is interested in identifying some of the many different fish species of the Eritrean Red Sea. This book will play a part in the wise and sustainable exploitation of the fisheries resources of the country and hence contribute to global, regional and local conservation of the fishery resources. A total of 221 species belonging to 63 families from crustaceans, cephalopods, cartilaginous and bony fishes (including ornamental fishes) are described and illustrated with their colour pictures. This book is based on many years, research data collected in the Eritrean fisheries database. Special Note: The eBook version of this book is no longer available. About the Author: AMANUEL TESFAMICHAEL: Amanuel Tesfamichael was born in Eritrea, a new country in NE Africa in September 1973. After completing his Secondary Education, he has joined the university of Asmara, Eritrea, and graduated in 1995 with the field of Marine Biology and Fisheries. After his graduation he joined the Ministry of Fisheries (then named as Ministry of Marine Resources) in the Research and Training Division, in the Fisheries Research Unit in different sites in the entire Eritrean Red Sea coasts and islands - first stationed at Massawa, the northern port city of the Eritrean Red Sea and later at Assab, the southern port city with ample internationally joint and national marine fisheries researches. He worked as head of the research team in Assab for the past four years, he is back to Massawa working as head of the Fisheries Research Unit and manager for the Eritrean Fisheries Data Base System in Massawa. 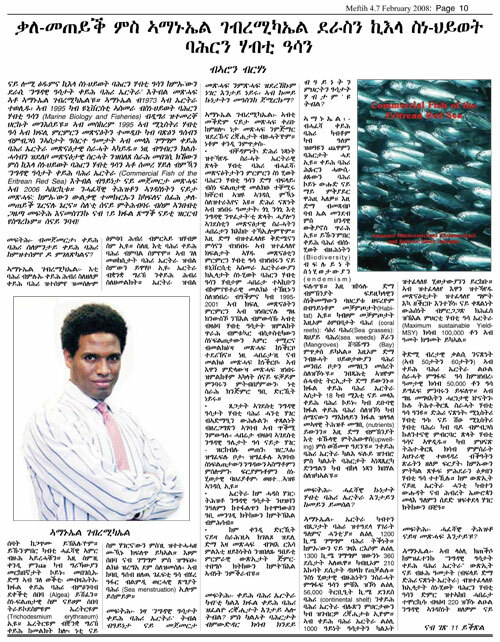 Amanuel was able to collect, collate and analyze seven years data and present it in the present book named as “Commercial Fishes of the Eritrean Red Sea” of its first kind in the Fisheries sector of the new Country. SEMERE HAILE SEBAHTU: Semere Haile Sebahtu was born in January 1973, in the capital city of Eritrea, a new nation in the horn of Africa, bordering the Red Sea, between Djibouti and the Sudan. After completing his high school studies, he joined the only university in the country - University of Asmara where he had his first degree in Marine Biology and Fisheries. After graduation in July 1996, he joined the Research and Training Division of the Ministry of Fisheries as Marine Biologist where, he had been participating in various research activities conducted locally or in collaboration with international institutes. During his career, he was able to gain ample knowledge and experience in the taxonomy, Biology and dynamics of the diverse species of fishes found in the Eritrean Red sea as well as in the physico-chemical aspects of the Eritrean Red Sea. Currently the author is doing his masters in GIS and Remote Sensing at the University of Free State, South Africa. This is a book that comprehensively covers what has been long sought after by potential investors and ornamental fish enthusiasts. 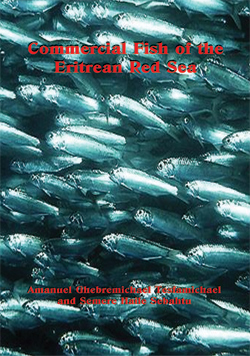 Amanuel has produced a book, which is one of its kind for the Eritrean Red Sea Fishes. It will be a main reference for future Marine Resource assessment, management and conservation researches that could be done at national or regional levels. Commercial Fishes of the Eritrean Red Sea is a comprehensive, multi purpose, both Scientific and Commercial, research product of its first kind on the fishes of the Eritrean Red Sea. Satisfactorily done by young and intuitive fisheries scientists of the new nation. Commercial Fishes of the Eritrean Red Sea analysed and presented the many years untouched data in the Eritrean Fisheries Data Base System with Scientific, Commercial, management and academic value, the many years marine research experience of the authors is paid off. Commercial Fishes of the Eritrean Red Sea not only compiles the different taxonomic entries and descriptions, it is unique in providing some valuable information on Eritrean Fisheries during the last 10 or so years after independence. It is a teaching, research and outreach asset; it will give opportunity to a wider audience ranging from fishermen to researchers and decision makers. I would like to commend Mr. Amanuel for taking this bold initiative. An Eritrean product - first of its kind! I'm sure this will set unsaid examples to the rest of us in the scientific community. 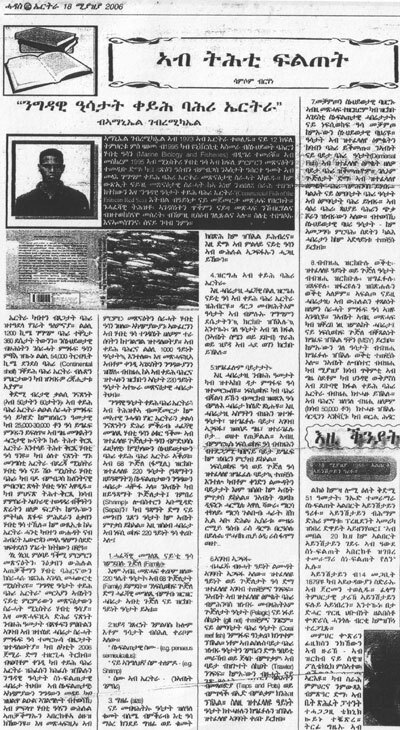 Title: Commercial Fishes of the Eritrean Red Sea, Authors: Amanuel Ghebremichael Tesfamichael and Semere Haile Sebahtu, Publication Date: 16 February 2006. Preparation of this book has been initiated with the objective of providing a guide to some of the many commercial fishes of Eritrean Red Sea and the marine environment they inhabit. This guide is designed as a working tool for fisheries workers, investors and a general reader who is interested in identifying some of the many different fish species of the Eritrean Red Sea one is likely to encounter in the local market or when snorkeling or scuba diving. More over this book will play a part in the wise and sustainable exploitation of the fisheries resources of the country and hence contribute to global, regional and local conservation of the fishery resources. The scope of this guide ranges from highly precious and esteemed fishes for both food and aquarium trade, to fishes not preferred for food but otherwise used as bait or fishmeal. A total of 221 species belonging to 63 families from Crustaceans, Cephalopods, Cartilaginous and bony fishes (including ornamental fishes) are described and illustrated with their color pictures. Selection of species was based on data from the Eritrean Fisheries Data Base System, which collects collates and analyses fisheries data collected since 1995. Fresh water fishes are not treated in this book. General discussion of the families precedes the species description. Each family heading begins with the Latin family scientific name followed by English family common name in brackets. The description, which then follows, contains information on the principal family characteristics; habits and commercial importance indicated by catch statistics, followed by list of common species under the family. The heading for each species contains scientific names, vernacular English names and local names (where available). After the species name heading follows a color picture of the fish. Most pictures which were not available in our gallery were taken from Dr. John E. Randall’s Red Sea collections, with permission from the Author him self, for whom the authors dedicated this book. Following the picture of the fish is the species description including the species maximum size usually as total length (unless otherwise specified as standard length or fork length), distribution of the species in Eritrean waters, major fishing grounds of the species in Eritrea, common fishing methods, behavior, habitat and biology, the peak season of availability of the fish, and separate catch proportion estimated from its family (when available). Since it is comprehended that this kind of guidebook is the first of its kind in Eritrean fishery resources, the authors are subjected to include many facts in the introductory part introducing Eritrea and its fishery considering as the first part of the book.